Every once in a while a movie comes along that is so singularly expressive that it makes you wonder why no one else has made a movie like it before. Such a movie is Columbus, the creation of video essayist Kogonada. It’s a hugely impressive feature debut, a visual tone poem that combines stark, formal screen compositions with nuanced emotional content, and which allows both these aspects to complement each other naturally and without any sense that either have been forced together unnecessarily. 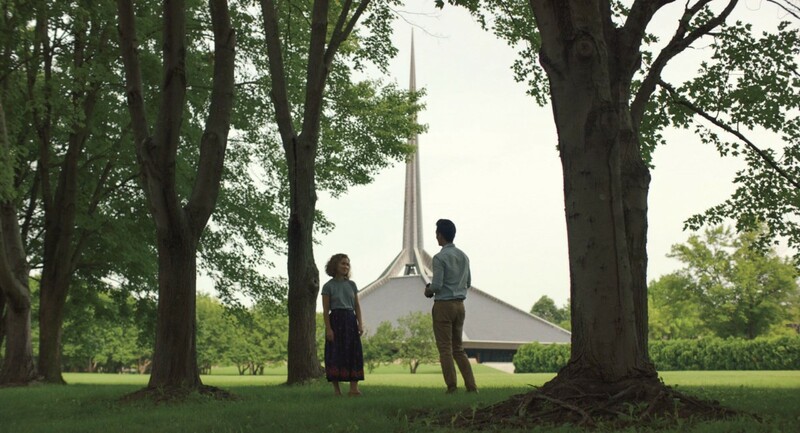 There are many unique buildings in Columbus, Indiana, and Kogonada incorporates them as supporting characters, rigid backdrops that provide insights into the hopes and dreams that Casey feels she has to suppress, and which Jin has abandoned. Through the use of careful framing, and recurring visual motifs – many shots are of doorways and what’s beyond them – the movie paints a wonderfully distinctive, and unexpectedly immersive portrait of a friendship that’s increasingly defined by the characters’ relationship to the spaces around them at any given time. Whether it’s Casey dancing wildly outside the formidable façade of the school she attended, or Casey and Jin having an argument within the confines of a covered bridge, the choice of location always enhances the emotional requirements of the scene in question. While the relationship between Jin and Casey remains the kind of friendship that only exists in the movies, the script doesn’t allow itself to fall into any of the usual traps where romance rears its inappropriate head, or misunderstandings cause a rift that’s resolved too easily in the final scene. Jin’s sobering sense of duty (Korean tradition has him waiting at his father’s bedside to ensure he doesn’t die alone), is at odds with his need to live his own life free from the parental and cultural constraints he’s broken away from. Meanwhile, Casey’s own sense of duty (how will her mother cope if she leaves? ), keeps her from achieving her own escape. Their friendship allows both to learn some valuable lessons from each other, but this is done in such an organic, subtle way that it feels fresh, and the outcome less than predictable. Cho and Richardson are both excellent, each giving beautifully measured performances that bring their characters to life in ways that are entirely truthful and recognisable for their aspirations and vulnerabilities. The movie adopts a slow, stately pace that suits the material, and there are narrative gaps that add a sense of mystery and which keep the viewer “on their toes”. But all in all, this is a beautiful, fascinating, lustrous gem of a movie and one of the finest in recent years. 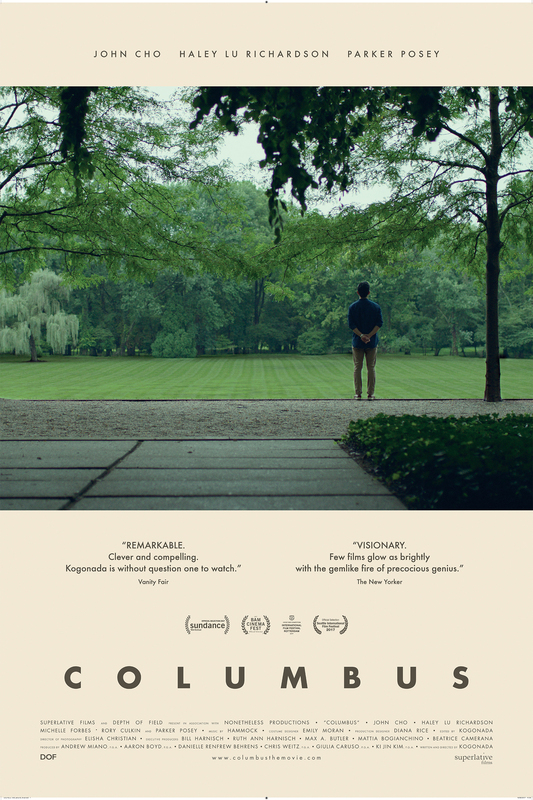 Rating: 9/10 – with its visually stunning look courtesy of writer/director/editor Kogonada and DoP Elisha Christian, and a poignant central relationship that’s expertly played by its leads, Columbus is an unexpectedly moving treatise on loss and love that rewards the viewer at every turn; not for everyone, but for those willing to give themselves over to it, this is an exceptional movie that mesmerises and fascinates, and which does so long after it’s over.